I think it was obooki who first suggested I watch Paul Verhoeven’s Soldier of Orange – Soldaat van Oranje in a comment on my Starship Troopers post. I’m certainly glad he did. It’s like a companion movie to one of Verhoeven’s latest movie Black Boek – Black Book. While I thought Black Book was quite good – although not as good as many other resistance movies – I’d say Soldier of Orange is far superior and deserves to be named among the best. I have a predilection for the WWII sub genre of resistance movies and I’m aiming at watching them all sooner or later. Most of the really good movies I’ve seen were either French or Nordic in the broadest sense (including Germany and the Netherlands). Soldier of Orange is based on the autobiographical novel of the Dutch resistance leader Erik Hazelhoff Roezelma. It tells the story of six upper-class university students whose lives are profoundly changed by WWII. While one of them becomes a member of the German-Dutch SS, the others are soon joining the resistance. The two best friends Erik Lanshof (Rutger Hauer) and Guus Lejeune (Jeroen Krabbé) are the two main characters. While Guus is a resistance leader, Erik is at first reluctant to even join but the longer the Nazi occupation lasts, the more he feels the urge to do his bit. With the help of their friend Robby and his radio they get into contact with the resistance in England. The first mission they organize goes very wrong. One of their friends is captured, tortured and executed. Erik and Guus manage to escape but from now on they must be extra careful. Erik soon notices that he is followed. It’s obvious that someone has betrayed them and they are quite certain to know who it is. It must be one of their British contacts. The first part of the movie is set in the Netherlands. It shows how Erik changes. While at first this is only an adventure for him which he doesn’t take too seriously, when he discovers he’s followed, he know he has to make a decision. Although his love interest, Robby’s Jewish fiancée, is in the Netherlands, he decides to escape to Britain and operate from there. The second part is set almost entirely in the UK. Erik and Guus meet the Dutch Queen Wilhelmina, who is in exile in the UK. She wants to get in contact with the Dutch resistance and establish a connection between the resistance in England and those at home. Shortly after their arrival in the UK, the two men are sent back again to fetch some of the Dutch resistance leaders. The movie contains all the typical elements one would expect in any resistance movie; adventure, danger, missions, betrayal inside the own ranks, torture, executions. What makes Soldier of Orange especially good is that it rings so true. The characters are quite complex and so is the Dutch society which is depicted. The movie doesn’t idealize anything, it shows how many traitors and collaborators there were among the Dutch. It is one of the Queen’s biggest concern what she will do with those after the war. The picture was remarkably fresh and from that perspective the movie could be very recent. The colors are intense and crisp, it’s really enjoyable to watch. The music however is dated. I’d say it’s a typical 70s war movie score. What surprised me was how cheerful and uplifting the tone was. Most resistance movies are slightly depressing. This one is not. Erik and Guus are both rascals, they enjoy women and adventures and while they would be glad if the war was over, the idea to cheat on the Germans amuses them so much that almost feel it’s all worth it. Their cheerfulness is quite infectious. All this together would have made me like the movie but what makes me love it is Rutger Hauer. Ever since I watched Blade Runner for the first time some years ago, I thought he was an extraordinary and very charismatic actor. From the point of view of the tone, I’d say Soldier of Orange is at the opposite end of The Army of Shadows – L’armée des ombres and Flame & Citron (Flammen and Citronen) which are both depressing and full of angst. The Army of Crime and Max Manus occupy the middle ground. I have seen many more pre-blogging and will need to rewatch some of those. Do you have any favourites? 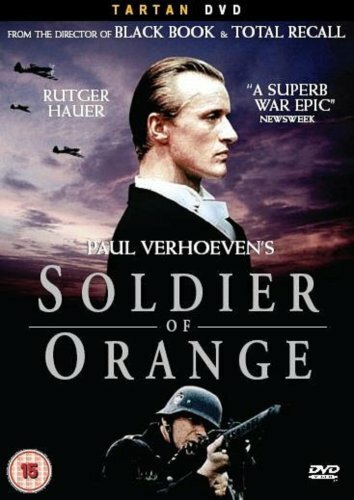 This entry was posted in History, Resistance, Reviews, War Movie, WWII and tagged Dutch Resistance, History, Movie, Paul Verhoeven, Resistance, Review, Rutger Hauer, Soldaat van Oranje, Soldier of Orange, True Story, War Movie. “The movie doesn’t idealize anything…” – you’re spot on, this is one of the many reasons why it is so good. It even goes as far as saying that, from a military point of view, the resistance acts which are depicted serve little purpose. And though I wouldn’t myself characterize the mood as ‘cheerful’, I would certainly agree on the humanism of this work. In Soldier of Orange, it is not the classic traits of heroism (resolve, achievement, sacrifice etc.) that are valued, nor the ideology, but the human qualities of the fighters themselves – something you can build a different post-war society upon. My favourites in your list are Rome Open City, Army of Shadows, and the two Verhoeven films. To which I would add Bresson’s A Man Escaped and Malle’s Lacombe Lucien (though the latter is more a Collaboration than a Résistance movie), plus a comedy: Ernst Lubitsch’s To Be or Not to Be. Lacombe Lucien is on my list of “to watch” movies but I always forget about it. Thanks for reminding me. Rome, Open City amd L’armée des ombres are both incredibly bleak. I did think Soldier of Orange was cheerful because Erik’s character is always cheerful nd I compared them. The events depicted are not uplifting. I agree, most of what they attempt turns into one hge failure after the other. Only when he joins the RAF, he is successful. I think that the movie doesn’t want to say that th resistance had little impact but rather that they could never be sure who was for and who was against them. Thanks Caroline: I was pleasantly surprised by The Black Book so I wil try and find this. I thought The Army of Crime was excellent. The Army of Crime is still my favourite but this was very good, surprsingly good. Good, I’m glad you liked it. All Verhoeven’s early Dutch films are good, but unfortunately none of the rest are war films!!! (Turks Fruit does have Rutger Hauer in it though). I really did, thanks for suggesting it. It’s interesting that he made a cicrle, starting with a resistance movie and going back to that topic years later. I’ve got Turks Fruit as well. There’s also two movies he made for the Dutch TV on the same theme: Gone, Gone in 1979, and the 1968 documentary Portrait of Anton Adriaan Mussert. I haven’t seen them. They’ve been published on a Dutch DVD (no subtitles). I’m not sure I’ve seen the Jesus obsession anywhere. I wouldn’t have thought Jesus was hidden behind that movie. My dad was a young man in WW2 and he is now 91. His view was that the German soldier of the WW2 was the greatest soldier that ever lived as it took the might of 3 continents to beat him and even then it was touch and go. Strange then that no one has ever made a movie telling this truth. Only movies depicting futile losers as winners with suitable uplifting music and the hero (yes, it’s always a bloke) pulling a stunner are made. Check how long it took for the Germans to restore after the famous “Dam busters” raid, for example (three days). Is this supreme efficiency and determination the real reason why Hitler is hated but Stalin excused? I hate them both equally by-the-way but let’s face facts. I actually agree with you – or your dad – and to be honest, the more I watch WWII movies and read about the subject, the more I’m amazed they didn’t win the war. If Hiter hadn’t been such a mad man, Germany would have stood a chance to win. I don’t think Stalin is liked or excused. It certainyl has something to do with the Russians helping to end/ win the war for the Allies and he is still far less known. Since the early days of the war until now, many theories on German military achievements have been developed, by all parties. To mention a few: a long and well prepared ‘war economy’, superior weaponry, a global ‘blitzkrieg’ doctrine, the intrinsic warfare superiority of the aryan (a favourite of nazi propaganda)… i’m afraid they no longer stand. The most prominent hypothesis today is that the German cadres were far superior to their counterpart’s. Understandably, none of their opponents – especially of course neither the defeated French nor the initially defeated Russians – were keen on recognizing that their own management system had been, and were to remain for the most part until victory, outclassed. In my view, this advantage was the product of and almost centennial military caste. The same hypothesis can be sustained about WWI, which partly explains the ‘knife if the back’ theory so prevalent in the German military during the interwar years – and so important in the rise of nazism. I think this is something most WWII movie refer to, albeit tangentially: German officers are almost always depicted as very clever, determined if not ruthless, highly task-oriented, and relatively autonomous in their tactical decisions. A rare combination of modern military qualities… which makes for excellent film villains. Now that you mention it, I remember having seen a Russian movie which focussed on the fact that Stalin purged the army. Or was that mentioned in the Finnish movie Talvisota? Not sure now. Was there no military caste anywhere else than Germany? Stalin also purged the soviet defence industry… both huge mistakes. I don’t know of any equivalent to the German officer corps. The Austro-Hungarians had similar ambitions in the XIXth, but before their empire was dissolved after WWI, they had become so bureaucratic they were never as efficient. I remember liking this movie quite a bit. I’ll need to revisit it soon. Every now and then Rutger Hauer finds a role that goes beyond a solid performance and it’s fun to watch. There are a few more I’d like to check out but can’t vouch for them (some are on your list…nice to see!). In all of the movies I’ve seen with Rutger Huaer he was really good. I was surprsied about how good this movie is. One to rewatch. I’m glad you mention Come and See, I’ve got it here just didn’t get around to watching it. I’ll have to check the others out as well. Thanks. I find resistance is a topic which generally inspires the more interesting film directors.